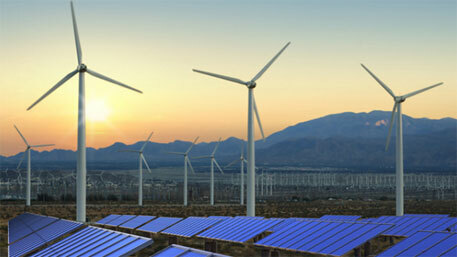 The world’s largest wind-solar hybrid energy system will be built in Kingston, Jamaica. Indiana-based Windstream Technologies will set up the renewable energy installation on the rooftop of the Myers, Fletcher & Gordon (MFG) law firm, reports pv magazine. The 80 kilo Watt (kW) installation will consist of 50 WindStream SolarMill units that will generate more than 106,000 kW hours of renewable energy annually. Each SolarMill will be able to generate 25 kW of wind energy and 55 kW of solar power. The energy system is expected to save the law firm more than $2 million in energy costs over the next 25 years. According to the company, SolarMill is a new energy technology consisting of vertical axis wind turbines, solar panels and proprietary “smart” electronics. The energy generated by each SolarMill can be used off grid with a storage system or inverted for use in grid-tied applications. Each SolarMill provides the highest energy density currently available in the renewable market and occupies roof space about the size of a solar panel. The hybrid energy system is part of a larger initiative by Jamaica Public Service (JPS) that will be launched across the country over the next 18 months. The aim is to provide greater access to renewable energy in a country where the cost of energy is three times the US average. WindStream COO Travis Campbell said the company was proud of its association with JPS, which is distributing the company’s products within Jamaica and throughout the Caribbean. “This SolarMill installation is an excellent model for other businesses to follow. If you are interested in energy efficiency and saving money, SolarMills are a simple, cost-effective solution,” he said. Solar and wind energy have gained popularity in recent times as more countries are switching to renewable energy to meet the growing energy demands of their population. Germany’s is leading the race. The European country’s Energiewende, or energy transformation, aims to achieve 80 per cent renewable energy generation by 2050. Renewable energy provided one-third of Germany’s power in the first half of this year. A Washington-based non-profit has ranked Germany as the most energy efficient nation in the world. Solar energy, too, is driving nations’ energy-producing capacity to a large extent. India’s largest solar power plant was set up in Madhya Pradesh early this year, with then Gujarat chief minister and BJP prime ministerial candidate Narendra Modi calling it the “saffron revolution”. According to a recent study, solar photovoltaic (PV) sector will be driving the growth in distributed power generation capacity globally by 2019. Europe’s dominance over solar PV sector is expected to diminish as the Asia-Pacific region, including China, expands its reliance on distributed PV energy. WindStream recently opened an office in Hyderabad, India, and has also secured distribution agreements in Turkey, Ghana, Liberia, New Zealand and Tanzania.